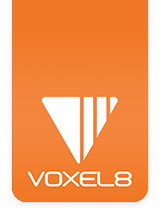 For Professional and Enterprise level customers, within Dashboard, there is the ability to create and edit custom Voxel8 commands and gcode which change the way the Voxel8 Developer's Kit Printer functions by creating base functionality (i.e. "Configuration files") or overriding defaults (i.e. "Mix-ins). NOTE: If you have not ordered the Voxel8 Professional or Enterprise solution plan then creating custom configuration files will not be available to you until you upgrade. Contact us if you have purchased, and would like to move to this level of plan. Configurations can be easily accessed from the top navigation bar (see Picture 001). Configurations are the defaults used to print your queued jobs, and normally contain basic attributes like temperature to print plastic, build volumes, extruding speed, and other basic criteria for printing (see Picture 002). Picture 002: A listing of common Dashboard Configurations. An example of a Configuration file is: "Gen3D with standard silver" which is the default to which you slice your print jobs (see Picture 003A & B). NOTE: The format for configuration files is JSON. Picture 003: A Sample configuration file for a Developer's Kit Printer with standard silver (A is for navigation of elements and B is for configuring each value within a configuration file). Mixins (short for "Mix in") are an easy way to override or add custom gcode and other printer command functionality onto your print jobs before slicing them in Dashboard. The format for new mixins is JSON (see Picture 004B) and can be assigned any string name (see Picture 004A). Picture 004A & B: Creating a new Dashboard Configuration file. Some examples include settings for Printing ABS, printing models with 100% infill, or printing them with supports. Instead of specifying these features through user interface, a mixin allows for you to write custom JSON parameters to set values for printing (see Picture 005B). Below is an example of setting a print job thermoplastic infill to 10% (i.e. a value of 0.1). If applied before slicing a print job, this mixin would override any standard infill configuration found in a main configuration file. Picture 005: Example Dashboard Mixin (A) that sets the thermoplastic infill of a print job to 10% (i.e. a value of 0.1). The following Euclid slicing parameters and configurations are supported by the Voxel8 Developer's Kit. It is very straightforward. You simply use the "New Config" button, and then carefully enter in the JSON code that assigns values, then save it off. When you're ready to apply it manually add it before slicing a print job. NOTE: You should consult the gcodes and euclid commands to figure out what is possible. The applications team here at Voxel8 has shared these commonly used configurations.